On a balmy, sensual, early summer night in the season now past the dashing Mr P and I were invited to a dinner, eaten out doors in the charming garden on a very good friend. She asked for a dessert for 6 and, it being the season of all things fresh and lovely, what better than an ensemble exploding with fresh strawberries. Now, I’m not going to give you an ingredient by ingredient recipe for these little tarts. 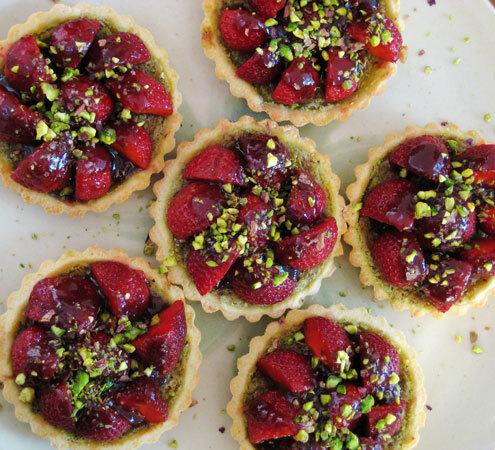 It’s simply a version of a typical little fruit tart, not dissimilar to these, or these, using a pate sable and a type of nut custard, like frangipane but with pistachios instead of almonds in both cases. I love including a fruit in puddings, as you’ve no doubt noticed. I tend to keep the sugar content a bit lower on the rest of the dessert and rely a lot on the sweetness in the fruit instead. 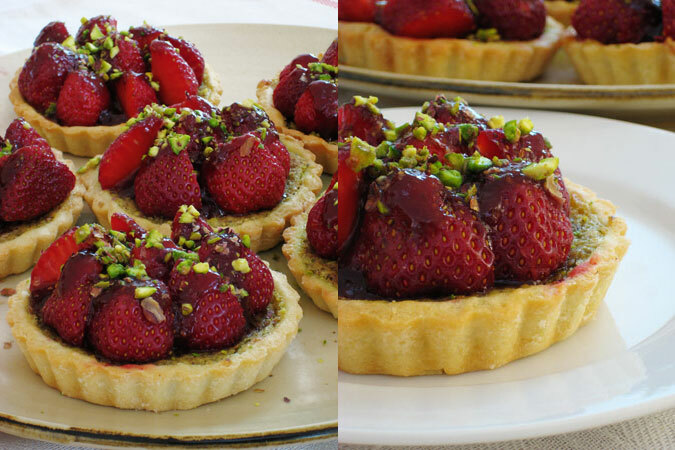 I think the ultimate difference with these tarts is that the tart shell is baked with the pistachio-cream, then when the tarts are cool the fresh strawberries are added on top. Somehow, a fresh strawberry is infinitely better than a cooked one on a hot summer evening, don’t you agree? *note: if you’re battling to get the strawberries to stand nicely on the cool tarts, heat a little strawberry jam and use as a type of glue between the fresh strawberry pieces. – beat the butter with the ground pistachios, salt and sugar until creamy. 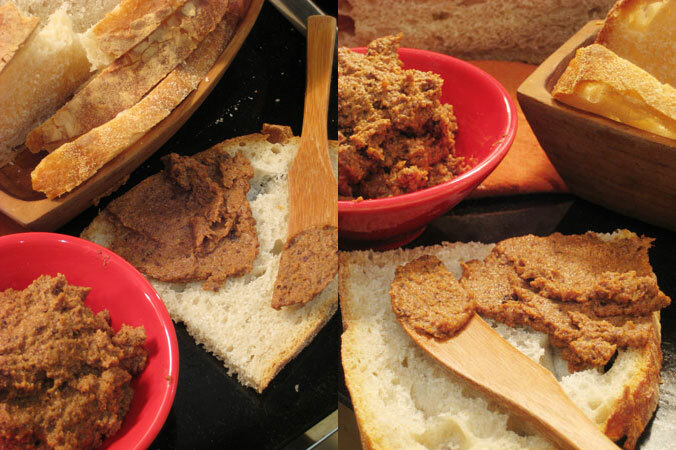 – beat ground pistachios, egg, sugar and butter until smooth. Refrigerate 10 mins until firm. – grease and flour 6 individual tart tins (about 5″ diameter) or, alternatively, one large 9 or 10 inch dish. – when the pastry is well chilled, roll it out on a floured surface to about 5mm thickness. Line each tine with pastry, trimming away excess. Keep combining and re-rolling the scraps of dough until all the tins are lined. – prick the bottom of the pastry with a fork a couple of times. 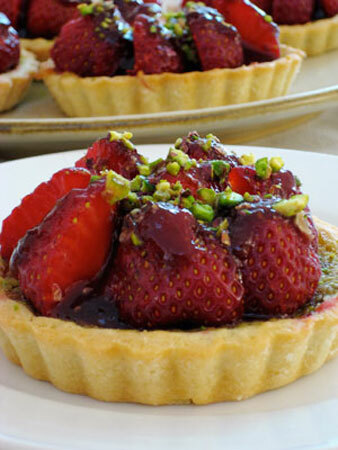 – divide the pistachio creme between each tart Shell and smooth out. – bake for about 20 mins until the pastry and the top of the pistachio creme is a lovely pale gold. – allow the tarts to cool for 10 mins before removing from tins. – wash, hull and halve the strawberries. Gently heat the strawberry jam. 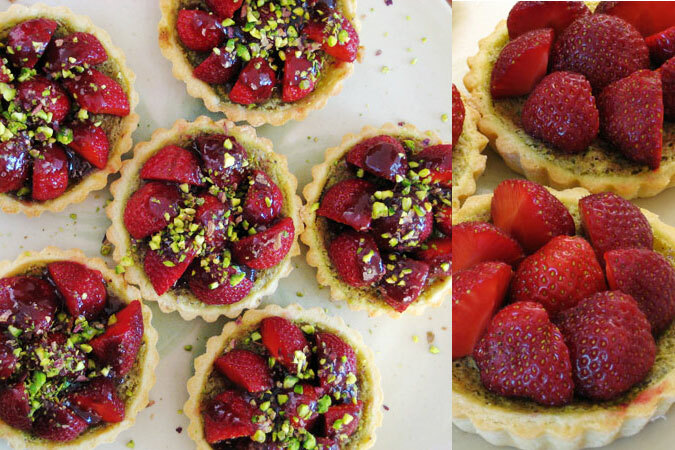 – when the tarts are completely cooled top with halved strawberries. Brush a little jam onto the berries of each tart. Top with a sprinkle with the chopped pistachios. We humans, for the most part, like a bit of ritual in our lives. Well, I know I do. Setting a certain, predictable rhythm to the day creates a sense of purpose and dependability, little ceremonies that break up the chaos in between our modern lifestyles. I like to read in bed with a cup of chamomile tea before turning in for the day, and I like having the time to sit on weekdays over my morning’s emails and news with a cup of good, hot coffee and a bowl of muesli. I usually mix my own muesli from jars of grains, nuts and fruits in the cupboard, but in the spirit of the Christmas Clear Out, I took the opportunity to use up the various stores of dried fruits and nuts left over from the Christmas pudding and fruit cake and mix up an enormous bowl of muesli to keep in jars, ready to go. 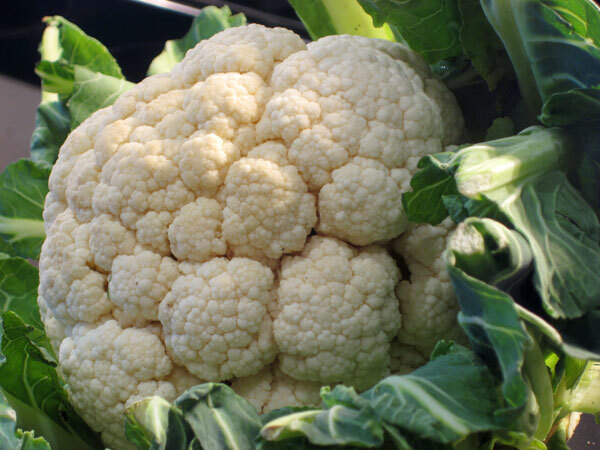 Just add yoghurt and that cuppa java. There’s no recipe for this, just use what ever you have on hand. 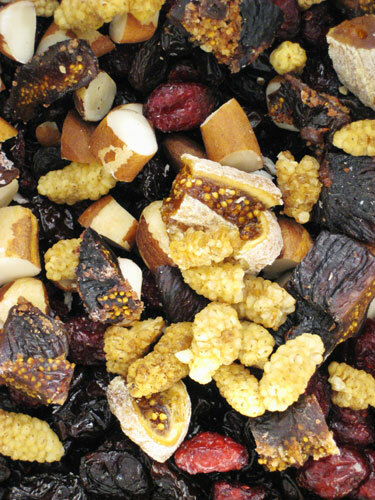 Start with handfuls of chopped dried fruit: I used cranberries , apricots and cherries for zing; papaya and pineapple for that almost candy like sweetness; and pears, figs, apples and dates for texture as well as raisins, currants, mulberries, prunes and oh, I forget what else. Add a few cups, to taste, of various grains: I used both raw, rolled oats and oat bran and a generous helping ground flax, to which I added poppy seeds, sesame seeds, sunflower seeds, coconut flakes and a variety of nuts (brazil, almond, walnut). 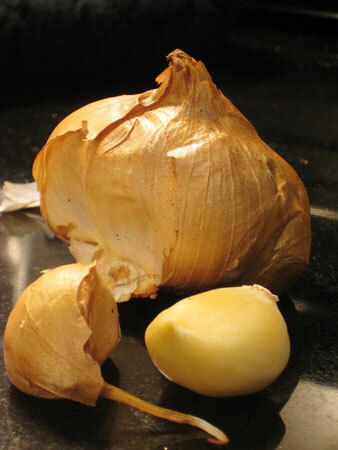 Sprinkle with cinnamon, a bit of nutmeg and a pinch of garam masala and mix it all up. 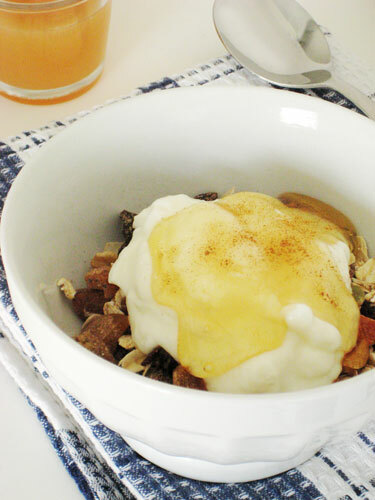 Make it as fruity or as whole-grainy as you like and you’ll never want boxed breakfast again. Promise.